We have established ourselves as a trusted manufacturer and supplier of Protein Powder. Under this category, we offer our customers a wide range of Ayu Pro Protein Powder. The powder offered by us can be taken as protein shake after exercise. In order to retain the optimum value of offered powder, we offer in attractive and airtight packaging material. Moreover, we offer protein powder to the esteemed customers at market-leading prices. 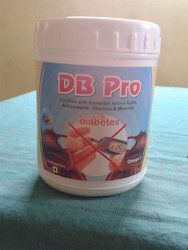 We offer diabetic protein which has soya protein base with milk protein in different flavours. Our diabetic protein is available in between protein range from 30% to 65%.It is very much useful for diabetic peoples.One of our diabetic protein powder is flavorless,colorless,odorless which can add it in to meal like Roti,Rice etc. You can consume it in the form of shake too. We offer milk protein in different delecious flavours in attractive packing.Our milk protein powder available with & without DHA , Omega 3 fatty acids.We can also formulate product as per rquirement. Proloss is helpful to control & reduce weight.Along with product it is necessary to follow diet plan & lifestyle.There will be chart for it. Pro mass is good for weight gain.It is soya protein based product with 65% protein. We are specialise in processing of gynecological protein formula. Our domain expertise has enabled us to come up with a range of Aprite Protein Powder. The offered powder range is protein enrich health supplement, which is widely popular among the gym going people. Protein powder offered by us is widely used to treat weakness of the patients and supply sufficient amount of energy. Clients can avail the offered powder range in chocolate and many more flavors as per their requirements. We offer the protein powder at market-leading prices.